Root canal infections directly affect the tooth's nerve, making them painful and dangerous to oral health. Endodontic treatments, like root canal therapy, can remove damaged or diseased pulp tissue to alleviate tooth pain and protect oral health. If you're experiencing tooth pain, you may be a candidate for root canal therapy. Servicing patients in Rancho Mirage, CA, Palm Springs, CA, and Palm Desert, CA, Dr. Bruno Lemay specializes in a variety of endodontic treatments to restore oral health and protect your smile. Schedule a consultation with Dr. Lemay to find out if root canal therapy is right for you. Spread of infection: Once a root canal infection takes hold, it may spread beyond the tooth, even into the jawbone. In some cases, patients may experience pus drainage from the infection through the gums or into the cheek. 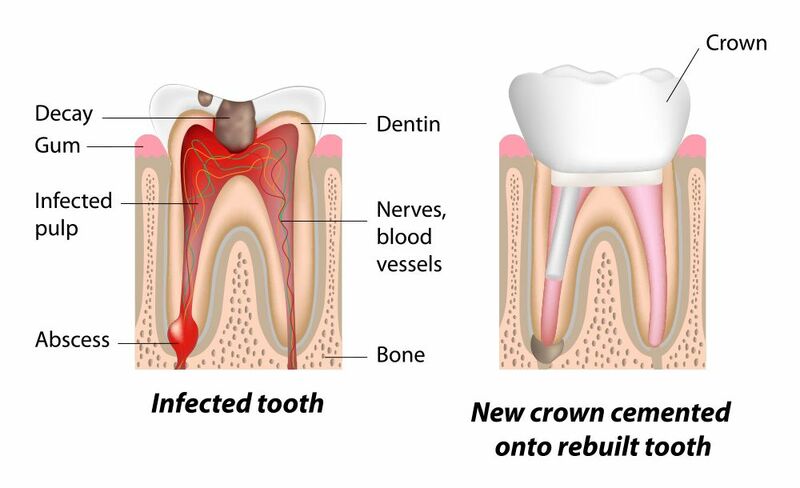 Bone loss: Root canal infections can lead to loss of jawbone as the infection spreads to the surrounding tissues. Abscesses: Painful, pus-filled abscesses may develop around the tooth roots if root canal infections are left untreated. Tooth decay: Tooth decay will persist if root canal infections are not treated. Tooth loss: Tooth loss can occur as a result of root canal infections. Facial swelling: Root canal infections can cause facial swelling. Tooth pain: One of the biggest indications of a root canal infection is tooth pain. Tooth pain can become so severe it may interfere with daily life. Root canal therapy can help protect your smile from the dangers of root canal infections. Root canal therapy is an endodontic treatment used to restore the health of teeth damaged by infected nerve and pulp tissue. Root canal therapy is performed using a local anesthetic to numb the treated tooth for patient comfort. A small hole is then made through the tooth to the root canal where all of the infected pulp tissue is removed. Next, any decayed portions of the tooth are removed and the tooth is thoroughly cleaned. The tooth is then sealed with a dental filling. For those with extensive damage, a dental crown may be required to restore the tooth's structure and add strength to the dental walls. Is Root Canal Therapy Right for You? Root canal therapy can help restore oral health and alleviate dental pain caused by infected pulp tissue. If you suspect you have a root canal infection, we encourage you to schedule a consultation with Dr. Lemay.